Just me indeed! Moments later I heard a young deer in distress and turned behind me to see one of our colonies toppled and nearby stacked equipment pawed through. I followed the fawn’s cry along the fence line and got my first glimpse of a young bear, with the crying deer in his mouth. That would be one of many sightings as the evening unwound. My experience with bears is, thankfully, limited. I did have a bear take down colonies in a former apiary location. 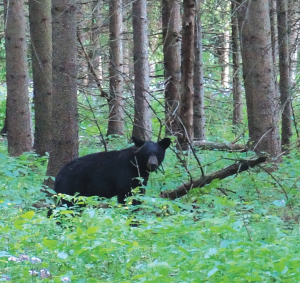 That bear had returned to the area a few weekends later – after I adequately reinforced the fence – visiting a friend who was camping in a tent on my property. I never saw that bear, but my friend moved on the next day. 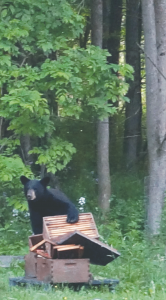 As I suited up and reassembled our hive Saturday night I knew that Winnie, and her sidekick Mars, would be inadequate deterrents for this tree and fence-climbing bear, despite the apiary location inside their fenced acreage. Action was needed. 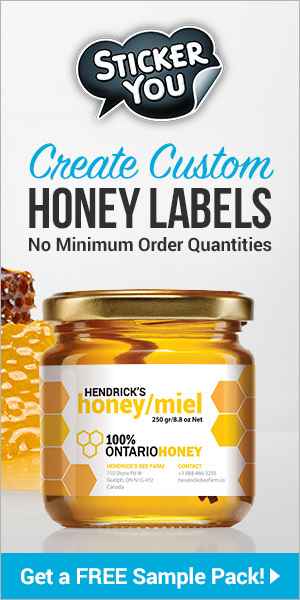 As I rummaged around in the barn trying to locate odds and ends of leftover electric fencing materials – to create a fence inside the fence – my husband, Todd, began yelling my name. 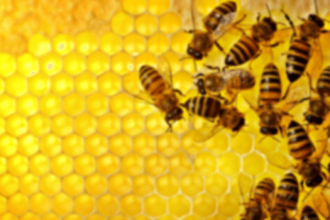 The bear was back in the bees, determined to have his fill of sweet bee brood – even if it meant that he had to deal with humans. As I watched the defiant beast from a safe distance, Winnie and Mars tore out of the house and across the yard. 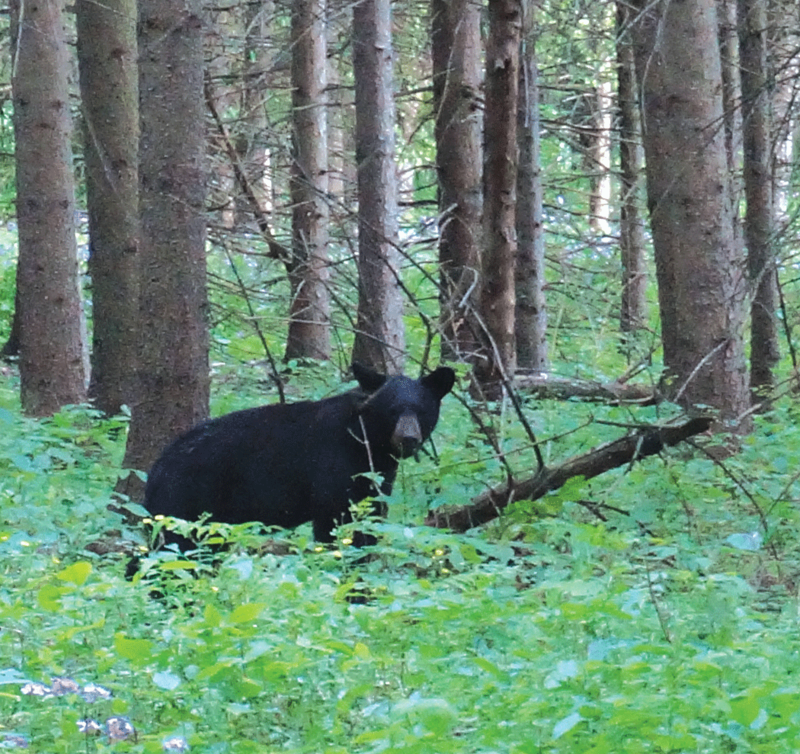 The bear, let’s call him Ursa, short for Ursa Minor, or “little bear,” since he is small and, like the constellations, always reappearing – quickly realized, thankfully, that he was outnumbered; he scampered up the nearest tree. After grabbing the dogs, while Ursa looked down at us from above, we went back inside and waited for him to scamper back down the tree and, hopefully, mosey on – he did. Our barbecue plans died along with the coals’ embers, as we set to work putting up a temporary electric fence to protect the bees from Ursa’s inevitable return. 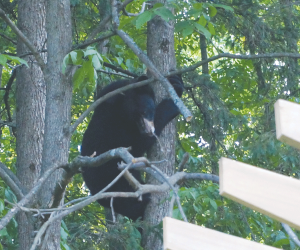 With a few salvaged insulators and partial roll of fencing wire, we managed to erect a zigzag assemblage of fencing at approximately little bear nose height with a top hot line running above the five foot wire fence section he was habitually scaling. We also put webbed strapping around each colony, in case Ursa returned and bypassed the electric wires. Miss Winne, as Winnie is called when she is not being a particularly good dog, had been howling incessantly earlier in the week during the overnight hours. To allow ourselves, and nearby neighbors, a good night’s rest, we had closed the doggie door Friday night to keep her inside. Saturday night, after the bear visit, we left it open. She howled periodically throughout the night. Perhaps she was howling at the crescent moon or at the chicken-loving fox that has been visiting our neighbor’s flock, but I suspect Ursa was out there, waiting for his chance to feast on fine bee fare. Looking out at the colonies Sunday morning – eyes blurry from little sleep – I could see all were still standing, intact. A more secure and permanent fence solution was needed. I have to admit that as I watered the garden Sunday evening, while the wind pulsed through the treetops and darkness crept over the valley, I kept a more watchful eye on the adjacent woods. For now, Ursa is keeping his distance and exploring elsewhere. Thanks to his youthful inexperience and our dogs’ tenacity, our bees are safe, happily foraging on Black Locust blooms and clover. 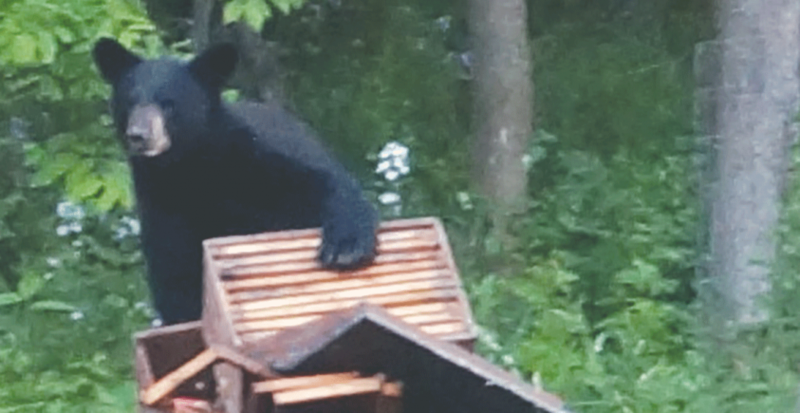 We hope that Ursa is safe too: that he has found a place, other than our bee yard, to forage and feast; a place to raise his young with miles of trees, fields and meandering streams, where he can roam and live happily – free from human intervention. As for me, I’ve completed a new fence to deter any further bear visits. My current configuration is six strands electric with six inch spacing for the middle four strands – bee nose height. This extends in front of the colonies and on the outside of the existing pasture fence that borders the woods. 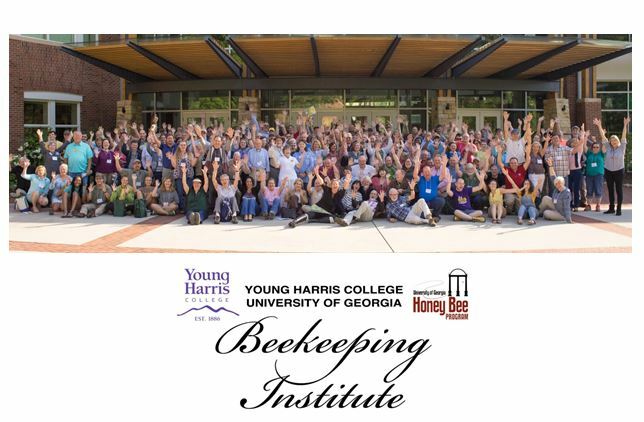 One of our challenges is that the bees are set back at the edge of a wooded area that borders thousands of acres of state land. Since the colonies are already inside the existing five foot wire fence (which had a hot wire to contain the dogs), this meant in order to use the back section of that existing fence I had to creatively wrap some hot wires around trees to prevent climbing. The other concern was equipment in the yard. Since we moved to this new location with our bees just a couple years ago, the infrastructure was not in place for proper equipment storage which could have been a factor in bear attraction (see the treed bear just above a shed that was almost ready to move equipment into). 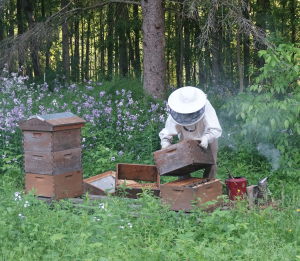 This experience only reinforced what I already knew – keeping clean yards with carefully planned and constructed fences is paramount to successful beekeeping in bear country.